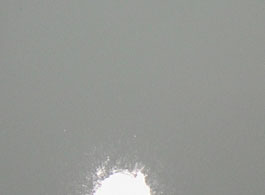 Ultrafine bubbles filled in the water (the image taken from the above of the test pool). 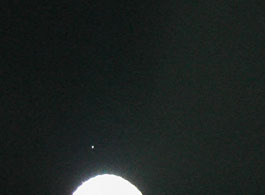 Serial photographic images showing the development of micro-nano buble generation.  Inside the test pool (The internal area is painted black for optical effect). Right after the air is infused. 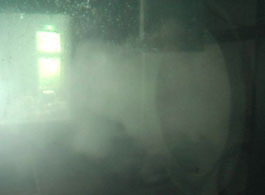 Ultrafine bubbles, or micro-nano bubbles, are discharged like white smoke. 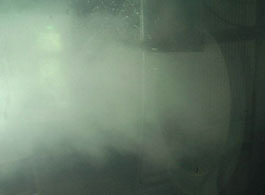 Ten seconds after air infusion. Twenty seconds after air infusion. The water in the test pool is completely clouded by generated ultrafine bubbles. 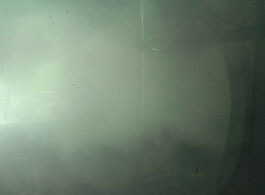 Thirty seconds after air infusion. The water has totally lost its transparency by massively generated ultrafine bubbles. It takes more than sixty seconds until the micro-nano bubbles in the 200ml beakerful water completely terminates, and the water regains its transparency.